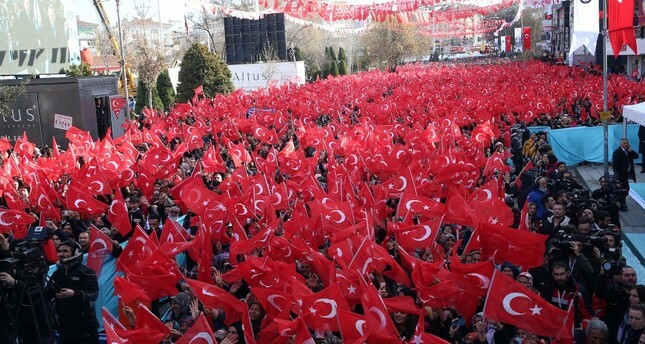 People gather in the district center of Sincan in Ankara to listen to President Recep Tayyip Erdoğan, Feb.11, 2019. The chairman of the ruling Justice and Development Party (AK Party), President Recep Tayyip Erdoğan, said Monday that in the field of municipal management the AK Party takes the leading role, stressing that the party's candidates for Ankara will be successful due to their profound experience in municipalities. "No one can compete with us in the field of municipalities," Erdoğan said during the opening ceremony of services on a sunny day in Ankara's Keçiören district. Addressing party supporters, Erdoğan pointed out that the AK Party has played a pivotal role in developing municipalities and stressed that in the upcoming March local elections, the party will continue its steps for development both with the Keçiören candidate and the Ankara metropolitan candidate. In the ceremony Erdoğan announced the inauguration of Keçiören Municipality's 26 projects, which have investments worth TL 190 million and Ankara Governorate's seven education institutions worth TL 143 million. Commenting on one of the projects called Ihlamur Valley in northeastern Gümüşhane province, Erdoğan said that this park is an exemplary monument and added that over 1,000 linden trees in this park will create a green place in Ankara. He underscored that various services were made available for people to relax, do sports and spend time with their family. The AK Party, which is known for its green policies, announced that there will be more projects to provide green places to people. Accordingly, the number of garden's for people is expected to increase in various cities in Turkey. Underlining that in 14 elections Keçiören supported the AK Party, Erdoğan stated that he does not have any doubts that this will change in the March elections. The ruling party nominated Turgut Altınok as candidate for mayor of Keçiören Municipality. He served in the same post 1994-2009. "I am content with the current state of the district and have been welcoming the developments," Mevlüde Şavur, 62, told Daily Sabah during the opening ceremony of the projects. As he previously lived in Keçiören, Erdoğan said he was happy to come to the district to inaugurate various projects and see his neighborhood. When a little girl called on the president and said she wanted to meet him, Erdoğan did not reject the child's request and asked her to come to his side. Erdoğan had a chat with the child and he also gave the girl a present. In relation to the municipal services in Keçiören, Kezban Yılmaz, 54, who has been living in the district for 25 years said they have been living in a peaceful and safe environment. She added that as inhabitants of Keçiören they expect Altınok to further develop their neighborhood. For the Ankara Metropolitan Municipality, the AK Party nominated Mehmet Özhaseki. Özhaseki is a former environment and urban planning minister, who now serves as a deputy from central Kayseri province and AK Party's vice chairman in charge of local administrations. He held the Kayseri mayor's office for more than 20 years and is experienced in urban development and management. Referring to the opposition Republican People's Party's (CHP) candidate Mansur Yavaş, Erdoğan said the party nominated a person who failed to win in previous elections while Özhaseki has proved himself five times in Kayseri and with his experience he will take more steps as mayor of Ankara Metropolitan Municipality. Erdoğan also attended the inauguration of some services in Sincan district and spoke about the new projects. He said that a people's garden will be built along Temelli pond, which will create a green space for people living in Sincan. Erdoğan stated that public transportation will also be improved as a new project of a 2-kilometer tramway line is expected to be set up. Underscoring that Ankara is an essential province of over 5 million people, Erdoğan said that in Ankara's districts and metropolitan municipality AK Party promises to take services to a higher level. He stressed that along with the Nationalist Movement Party (MHP), the People's Alliance will continue its cooperation to uphold the values and expectations of the people. The AK Party and the MHP first decided to form a political alliance for the previous June 24 elections. Erdoğan also announced that Ankara City hospital will be inaugurated within days and added that over 3 million patients will be able to benefit from the services. Havva Toprak, 57 said that she appreciates the steps taken in the field of health. "We previously faced many difficulties with access to health services. However, now we can easily get our treatments. Therefore, we welcome these steps."